Women’s Golf Association of India has been established as a nationwide honorary non-profit organization with the sole objective of upliftment of women through the medium of sport. 'Empowerment of Women through Sport', the motto of the organization highlights that it has created a structured plan to provide an opportunity to those from socially weaker sections to carve out a career as playing Professionals . The WGAI enables women to compete in an organized Professional Tour the Hero Women’s Professional Golf Tour, BT ProAm of Champions and various charity events which serve as launching pad for greater honors world-wide once Indian Amateurs reach the age of 18. Non-profit organization: - The WGAI (Pro golf) is a society registered under Society Registration Act of 1860. WGAI has initiated the first ever Caddy Training Program for both males and for the first time for females in partnership with Ministry of Tourism of India in July 2012. Women’s Professional Golf started 27 years after men’s professional golf in India. Former Chairperson of Indian Golf Union Ladies Section ( National Amateur Golf) Ms Champika Sayal mooted the concept in 2004 after she was invited to attend the WU YI forum in China during the Asian Ladies Invitational Team championship. Having been a former national player and an accomplished Golf Administrator she was called upon by Coordinator of The Asian Ladies Invitational Team Championship ( Queen Sirikit Cup) Mrs Rae Vadee Suwan to explore possibilities to start Professional Golf in India which could help to generate tournaments for players maturing from National Amateur Golf in Asian countries. After being India’s representative at the first ever World Women’s Golf Congress hosted by USLPGA in New-York in June 2004 after submitting a proposal to Indian Golf Union in 2004 July, it was decided to set up Professional Golf for Women in India under the guidance of a Secretary General. Mr Satish Tandon was nominated to be the first President of WGAI, Mrs. Kavita Singh was nominated to be the first Vice President, Mr VS Singh was nominated to be the first Treasurer of the Association, Ms Smriti Mehra India’s first Tour Player was nominated to be the first Chairperson of WGAI’s Player Division for 5 years, Ms Champika Sayal was nominated to be the first Secretary General of Women’s Golf Association of India (Pro Golf). India’s first 3 Arjuna Awardees Mrs Anjani Desai, Mrs Sita Rawlley, Mrs Nonita Lall Qureshi and Mrs Kiran Kanwar were invited to be Honarary Members of WGAI for life. Mr Pawan Munjal MD of HERO MOTO CORP was appointed Chief Patron of WGAI in 2010. On 22nd of October 2005, the first ever women’s professional golf skins game was played at DLF Golf &Country Club for a prize purse of USD 18,000/- sponsored by HERO HONDA. 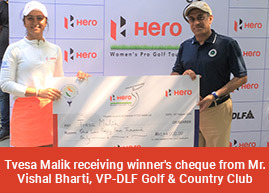 The Event was won by India’s first Professional Tour player Ms Smriti Mehra. The Chairperson of USLPGA players division Ms Heather Daly Donofrio came to launch Women’s Professional Golf in India. USLPGA guidance through both Smriti Mehra, Heather Daly Donofrio and the first Secretary General of WGAI compiled Professional Players Guidelines in 2006. Under the guidance of Mr Kochii Kato Commissioner of Ladies Asian Golf Tour, in 2006 the 1st DLF Women’s Indian Open and a 5 leg tour were conceptualized by Secretary General of WGAI. In October 2006 India launched a 5 leg tour for a prize purse of Rs 6 lacs with 5 players. In 2007 March Indian hosted the first Women International Professional Golf Championship the DLF Women’s Indian Open as co sanction event of Ladies Asian Golf Tour for a prize purse of USD100,000 . The first championship was won in a playoff by Taiwan’s Ms Ya Ni Yseng. • Make Golf a livelihood/career option for Indian Women. • Have an Indian Woman Golf Professional in the Top 50 World Ranking and a Women’s Golf Olympic Team for 2016 and beyond. • Popularize golf throughout the country, for women in particular. Encouraging them to take up professional golf as a serious career option. • To strongly establish the Domestic Tour in the Asian region as platform for budding young female golfers to compete with the best Women Professional Golfers in the Asian region, Europe and USA. • Women’s Golf Association of India (Pro Golf) is apex body for women’s professional golf in India. • WGAI aspires to have India be represented as a Women’s Golf Team at the Olympic Games 2016. • Promote Golf Tourism to India through hosting of World Class Women’s Golf championships. Copyright © 2019 WGAI . All right reserved.